NY residents and visitors alike, beware of any encounters with the Hogweed plant. Although pretty, it is a monster of a plant. It could leave you with some devastating blisters and burns if you come in contact with it, and it is potentially deadly. In fact, the plant is so dangerous that an Department of Environmental Conservation advisory was broadcast in NY to help warn people about it. The DEC website also lists the photos of the plant they will need so they can confirm it is a hogweed. Be sure that you do not brush up against or touch the plant when you are taking pictures of it. 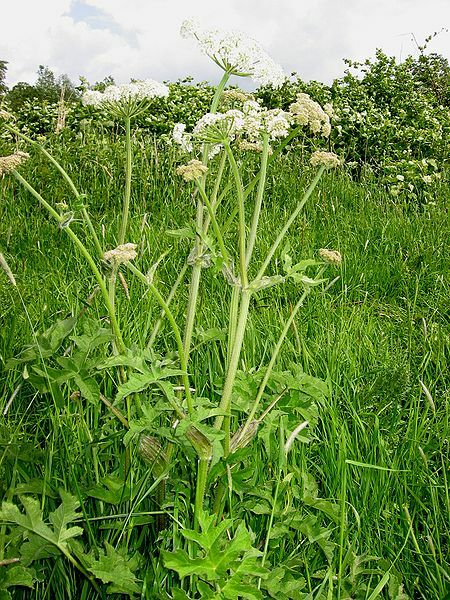 When I first saw a picture of the Hogweet plant, it reminded me of the flower Queen Ann’s Lace that children have been known to pick which is why it is so important that parents warn their children about it’s dangers. This very dangerous plant has been found in Muttontown, Long Island and a few other places in the Tri-state area. It can grow quite large, like a tree. It is hollow, so it can break easily, but if you get the sap from the plant in your eye – you could be blinded. According to wikipedia, “Giant Hogweed is a phototoxic plant. Its sap can cause phytophotodermatitis (severe skin inflammations) when the skin is exposed to sunlight or to UV-rays. Initially the skin colours red and starts itching. Then blisters form as it burns within 48 hours. They form black or purplish scars that can last several years. Hospitalisation may be necessary. Presence of minute amounts of sap in the eyes can lead to temporary or even permanent blindness. These reactions are caused by the presence of linear derivatives of furocoumarin in its leaves, roots, stems, flowers and seeds. These chemicals can get into the nucleus of the epithelial cells, forming a bond with the DNA, causing the cells to die. The brown colour is caused by the production of melanin by furocoumarins. In Germany, where this plant has become a real nuisance, there were about 16,000 victims in 2003. Children should be kept away from Giant Hogweed. Protective clothing, including eye protection, should be worn when handling or digging it. If skin is exposed, the affected area should be washed thoroughly with soap and water and the exposed skin protected from the sun for several days.